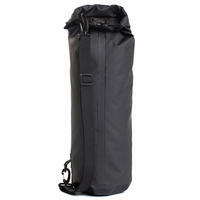 Waterproof dry bag with roll top to keep the water out. Stiffening strips keep the top open while filling the bag. 12 litre capacity is perfect for a swimsuit/shorts and towel. Perfect for a day at the pool or the beach. The Bulldog 12 Litre Dry Backpack has tough materials and construction with taped seams and a roll top closure, great for storing away wet or dry gear with confidence that there will be no moisture ingress in or out of the bag. The 12 Litre model has a single, removable shoulder strap which makes distance carrying more comfortable.